Before you start focusing on changing the dog, start by changing your home. If the canine is used to chewing items in the house, simply dog-proof it. You don’t need tons of sophisticated items to achieve this task. The first step is to simply hide things that the dog is likely to chew. Some of these items include remotes, pillows, books, and clothes. When you do this, not only will your dog be able to roam the house without finding anything meaningful to chew. It will also be unable to destroy the products that you buy for it. The second step is to get heavy duty gear that your dog can’t destroy. If they destroy their crate, then get something indestructible like the ones seen here bestdogcrates.net/escape-proof-cages. This is another method that can work well for those problem dogs, especially if you are not always around to monitor your dog’s movements and behavior. All you need is to put them in a dog crate or an empty room. You should always ensure that the crate is comfortable for the dog. Choose the right size of cage and make sure that it is well-ventilated. Don’t just sit back and watch your dog embarks on a chewing spree. Be reactive if you see it chewing something other than food. The easiest way is to make some noise that will distract it. However, you should not be extremely loud to the extent of scaring it. Just let the dog know the message that you are trying to pass across. You can say something like “Stop!” This approach can be considered as a form of dog training, because doing this consistently, will make the dog understand that you are not happy with the chewing habit. 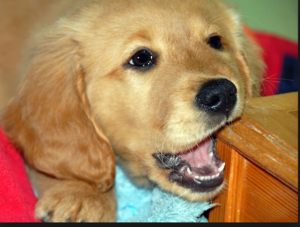 Sometimes dog chewing can be a deep-rooted habit and may be quite difficult for your dog to stop doing it. However, rather than chewing your items, you can give the dog alternatives-chew toys. These are very enticing, and your dog will easily get attracted to them. You can even make the toy fun by rotating them and stuffing some food items in them, such as peanut butter. Apart from being tasty, the dog will have some fun with the rotating toy and will keep chewing for a long time. In doing so, you will be able to save your other items from any sort of destruction for quite some time. In most cases, dogs opt to chew items because they are utterly bored to the core. In such a situation, chewing seems the best way of passing the time. The best remedy for this problem is to take the dog out for exercise. Some of the activities that you can engage in include jogging, running, Frisbee and even long walks. The aim here is to keep the dog productive in a healthy way. This is another effective way of stopping your furry friend from chewing everything that comes in its way. Buy a commercial deterrent. With such a product, you need to spray it on different items that the dog is likely to chew. A single bite on the item will be enough to send a strong message to the dog, and it won’t make any further attempts to chew the item. If the dog chewing habit is due to a compulsive disorder, you should consider getting help from a professional dog behaviorist. Do not surrender to the destructive dog chewing behavior. The little steps that you take can make a difference. The above are the most recommended solutions that can stop the chewing habit.